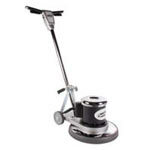 Many of our 17 inch 175 RPM floor polishers/buffers can be used for both carpeting and hard floor use! 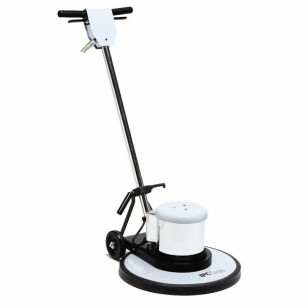 This low speed rotary floor buffer happens to be one of them. It has a steel shell to be used with hazardous, or aggressive chemicals. You may experience some rusting when dealing with aggressive chemical stripping solutions. So we only recommend using mildly aggressive chemicals with this machine. Don't be without a rotary floor buffer for your facility, it will improve the appearance, and give you a more professional feel.